Competition Archives · Page 2 of 477 · Stop the Cap! Amazon is planning to finance the launch of a new global satellite internet service, powered by a fleet of more than 3,000 low Earth-orbiting satellites that will deliver high-speed internet service to rural underserved and unserved communities, opening up the possibility of millions of potential new Amazon.com customers. Known as Project Kuiper, named after a famous Dutch-American astronomer, the project is enthusiastically backed by Amazon founder Jeff Bezos, and will require billions of dollars in investment. The proposal claims Amazon will launch 3,236 small satellites into space in about a decade, which experts claim is plenty of time for the ambitious project to either flourish, be changed, or scrapped under pressure from Wall Street. Although the marketing focus of the project will be on reaching rural and unserved areas, the satellite broadband network would deliver data coverage anywhere within a range of 56 degrees north to 56 degrees south latitude, which would cover virtually every continent, except extreme South America, Antarctica, parts of far northern Russia, Alaska, and Canada. About 95 percent of the world’s population would be reached by Amazon’s satellite project. Most similar ventures promise much faster and more responsive service than traditional satellite internet service, at a much lower cost. 2015: Facebook scrapped plants to spend up to $1 billion on satellite internet access for Africa and other under-covered continents. 2002: Teledesic closed its doors after spending $9 billion on a similar low Earth-orbiting satellite project backed by Microsoft founder Bill Gates. Amazon could have competition if any of the projects still in progress actually begin offering service. Elon Musk’s SpaceX launched two test satellites for its “Starlink” network last year, the first step toward its goal of a constellation of 4,425 satellites. In March 2019, Softbank-backed OneWeb launched the first six satellites of its network, which plans to begin with a constellation of 650 interconnected satellites. Boeing and Canadian satellite operator Telesat have their own plans for a satellite internet project. Amazon has very deep pockets and has the financial capacity to fully fund the project, but not without likely protests from investors concerned about the cost and history of earlier flopped ventures. Additional details can be found in these three sets of filings made with the International Telecommunications Union last month by the Federal Communications Commission on behalf of the Amazon-backed venture. JPMorgan “still believes in the potential of an eventual merger of Charter Communications with Altice USA, despite a cool-down in tie-up talk,” according to a short piece in Seeking Alpha. The Wall Street bank favored a Charter merger with Altice, which owns Cablevision and Suddenlink, because Altice has proven its ability to ruthlessly cut costs out of the cable business, potentially bringing $2.7 billion in synergy savings from layoffs, outsourcing, and killing off employee perks. JPMorgan analyst Philip Cusack believes the biggest merger prize would be a combination of Cablevision’s footprint in downstate New York, Connecticut and New Jersey with Charter-Spectrum, which serves almost all of New York State and already has a presence in Manhattan and other boroughs in New York City. Cusack also argues Cablevision’s Optimum business would be well served by a familiar executive. 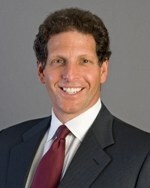 Rutledge was Cablevision’s chief operating officer before moving to Charter. Two years ago, Altice considered acquiring Time Warner Cable, before investors forced Altice to pull back on further acquisitions that would result in even more debt for the European telecom company. Among the likely challenges would be antitrust and regulatory roadblocks, particularly if Charter is the lead company. Charter is still in hot water with New York’s Public Service Commission and its own merger with Time Warner Cable was decertified by the regulator last summer. It could be a long leap from antagonizing New York’s telecom regulator and the attorney general to winning a green light for yet another cable merger. The letter includes an offer for Spectrum’s best internet deal, available only to addresses identified as already getting high-speed internet competition from at least two other providers — 400/20 Mbps internet service for $29.99 a month, price-locked for three years. In contrast, Google Fiber customers in the Triangle region of North Carolina pay $50 a month for 100 Mbps or $70 a month for 1,000 Mbps. That makes Spectrum’s offer a better deal, with for four times the download speed Google offers on its lower-priced plan. Raleigh’s News & Observer spoke with Joe Mancini, head of sales for Google Fiber’s Triangle region. Mancini called Spectrum’s letter a “scare tactic.” Spectrum had no comment. 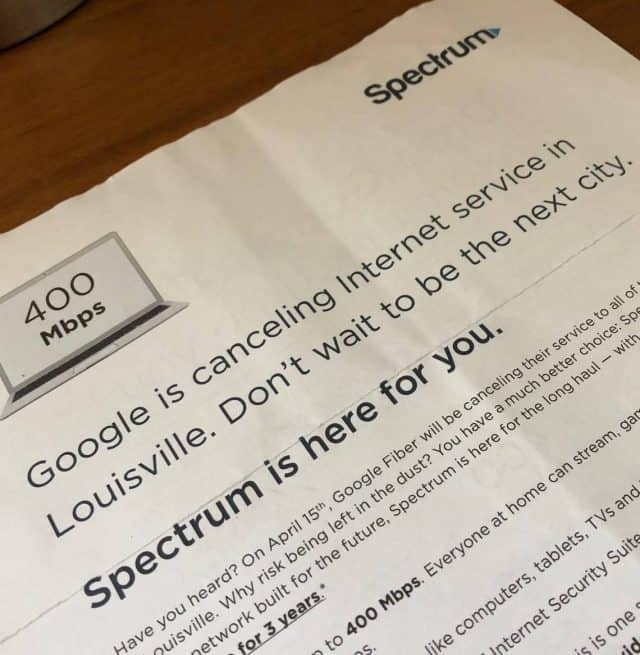 The letter could connect with would-be Google Fiber customers still waiting for service. Since being announced in the area in September 2006, Google Fiber’s first target was the community of Morrisville. As of today, the service is available in selected areas as far east as downtown Raleigh, and in Chapel Hill, southern and downtown Durham, and adjacent areas. But Google Fiber still has a long way to go to reach the entire region. Google Fiber announced it was pulling out of Louisville, Ky., after a failed experiment microtrenching its fiber optic cables just a few inches underground. That proved disastrous, with cables emerging above ground as a result of incidental digging, erosion, road construction, freeze-thaw cycles, and in some cases, pets. Realizing it would have to scrap the entire project and start anew, Google instead decided to abandon the city, switching off existing customers on April 15. Google has significantly slowed expansion of its fiber network over the last few years, and at one point signaled its future attention would focus on urban wireless mesh technology that would work like high-speed Wi-Fi. But that project seems to be dragging as well. As a result, some consumers may worry if Google is in the broadband business for the long haul. Mancini says the company is, and has continued expansion into new parts of the region earlier this year. This is the second part of a two-part series reflecting on Verizon’s 5G millimeter wave wireless home broadband service and how Wall Street complicates its potential. Be sure to read part one, “How a Wall Street Analyst Complicates AT&T and Verizon’s Upgrade and Investment Plans” for the full story. Moffett’s philosophy about emerging broadband technology and competition is heavily influenced by his personal and professional belief that broadband competition is bad for business and investors. His distaste for Verizon FiOS, a plan to scrap old copper phone wiring in favor of fiber optics, was well-known across the industry and trade press. 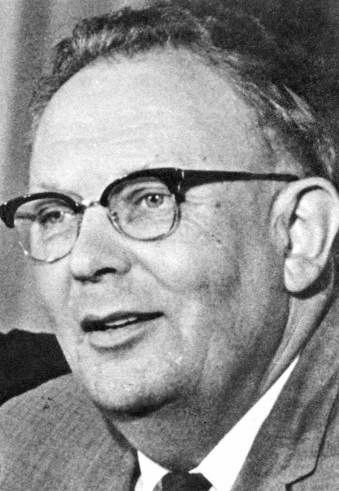 But Verizon kept going with the project under the leadership of then-CEO Ivan Seidenberg, who was a telephone man through and through. But by 2010, Seidenberg had decided to retire, and his successor, Lowell McAdam, had a very different perspective about Verizon’s future. McAdam spent almost his entire career from the early 1990s forward in the wireless business. In 2006, McAdam was named the chief operating officer and CEO of Verizon Wireless. When he succeeded Seidenberg in late 2010, Verizon had already announced it was winding down further FiOS expansion. That seemed to suit McAdam just fine, because under his leadership as CEO of Verizon, Verizon Wireless became the dominant focus of the company. Heavy investment in wireless continued, while Verizon’s landline network was allowed to deteriorate. Moffett told his clients the end of FiOS expansion would be good news for cable companies because they would lose fewer subscribers as a result. More than a decade later, Verizon’s decision to embark on another major technology upgrade requiring billions in new spending quickly raised eyebrows on Wall Street. This time, however, Verizon executives attempted to be better prepared to defend their 5G vision from the reflexive investor argument that it was too expensive and extravagant. Most of the expenses cited by Moffett relate to bringing fiber networks into neighborhoods to support the small cell technology Verizon is relying on for its 5G home broadband and mobile services. Moffett also believes the only attractive market for 5G service will be in more upscale suburban rings around cities, not densely populated urban centers or rural areas. Moffett argues fiber providers are likely already providing service in urban areas and rural areas simply lack enough customers to justify the cost of either a fiber optic network or a small cell network. Ironically, that conclusion means the same suburban ring Moffett rejected 5-10 years ago as economically unsuitable for fiber service is now precisely the area Moffett argues is the only attractive market for fiber service, to bring 5G. From a short-term results perspective, laying fiber optics is a costly proposition unlikely to return much revenue gain in a few short years. That reality has kept many investor-owned phone companies away from expensive network upgrades. These legacy telephone companies recognize they are going to continue to lose customers to faster technologies like cable, fiber, and perhaps, wireless. But managing an existing low-speed DSL business seems preferable to facing the wrath of investors upset over the prospect of shareholder dividends and share buybacks being curtailed to redirect money into a full-scale upgrade effort, even if it results in better returns and greater revenue a few years down the road. Verizon is depending on its wireless division’s extremely high profitability to counter the usual objections to major upgrades, and by focusing on how 5G will enhance the wireless experience. It also benefits from media hype surrounding 5G technology, exciting some investors. But Verizon is also downplaying exactly what it will cost to lay fiber optic networks deep into neighborhoods to deliver it. Moffett decided to bypass the traditional cost-benefit analysis of laying mile after mile of optical fiber and decided to test Verizon’s case for wireless 5G home broadband instead. 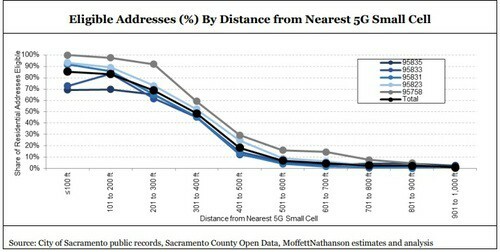 Six months after launch, Moffett investigated Verizon’s 5G millimeter wave network in Sacramento, examining how the service is initially performing. 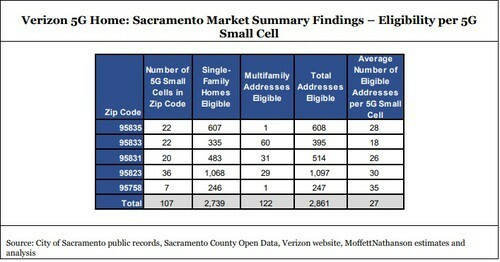 Moffett identified seven zip codes in Sacramento where service was most likely to be available, based on cell tower/small cell records. As of late February, Moffett found Sacramento had 391 Verizon small cells installed, with 273 used for millimeter wave 5G service (the rest are likely designed to bolster Verizon’s 4G LTE network). Verizon has admitted small cell technology is vulnerable to distance, so Moffett relied on earlier purported claims of 5G coverage to limit the number of addresses to be sampled. Moffett’s team identified 45,000 out of 70,000 possible addresses, based on if those homes were located within a radius of 0.7 miles of a 5G small cell. Then, Moffett’s team devised a method of hitting Verizon’s 5G availability website with each of those 45,000 addresses to learn which ones Verizon qualified for 5G service. Only an average of 6% of the queried addresses were actually eligible to receive Verizon’s fixed wireless service. That could mean Verizon has installed 5G small cells, but some are not yet operational in all areas or the network is performing much worse than originally anticipated. Some zip codes did better than others, but not by much. The best offered just an 18% pre-qualified acceptance rate. Apparently Verizon’s qualification website also informs applicants if they already have service, which proved to be a good way of finding out how many addresses actually have signed up. 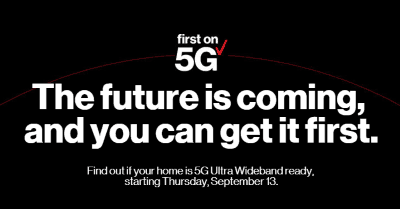 Moffett claims only 3% of eligible customers have decided to subscribe to Verizon’s 5G home broadband service so far. Coverage appears to a problem. As Moffett checked addresses further away from each small cell, more and more were deemed ineligible for service. In fact, despite Verizon’s claims that its 5G signal reached customers more than 1,900 feet away, the company’s own website refused to actually sell service to customers that far away. Moffett found subscribers were deemed ineligible for service as little as 400 feet away from a small cell. At that distance, less than 50% of checked addresses could sign up. For those 700 feet or more away, almost no addresses were qualified for service. Each small cell serves approximately 27 eligible addresses. Verizon’s 5G home broadband has a 0.1% market share in Sacramento. Excluding areas where multi-dwelling properties dominate, Verizon has achieved a penetration of roughly one subscribed single-family home per 1.5 5G small cell. “Our findings in Sacramento — limited coverage, low penetration — preliminary though they may be, suggest that earning an attractive return will be challenging, at best,” Moffett concluded. Because Verizon has attracted so few subscribers thus far, the total cost per connected home for 5G wireless service could far exceed what it would cost to just lay down fiber to the home service to each customer, which might actually give Verizon more business. If Moffett’s estimate of 27 residences served per small cell was proven true, Verizon would have to deploy well over five million small cells to deliver 5G wireless service across America. Verizon’s choice of cities to launch its 5G millimeter wave network may be partly designed to test the differences in topology, building density and foliage levels, and there may be dramatic differences between Houston, Sacramento, Indianapolis, and Los Angeles. As AT&T continues to build out its fiber to the home network in its landline service areas, the company estimates it could achieve 50% market penetration by 2023, triggering a growing wave of consumers dropping cable in search of a better deal. Cowen, a research firm, issued a report to clients indicating if AT&T achieves its expansion goals, it will be a tough competitor to Comcast and Charter. Both cable companies have pulled back on promotional and customer retention pricing in recent years, allowing customers to follow through on threats to disconnect service. AT&T Fiber is expected to be a frequent destination for those unhappy cable customers. As AT&T’s fiber network expands, it could eventually grab one million customers each from Comcast and Charter, as well as another 200,000 cancelling service with Altice’s Suddenlink. If the estimates prove accurate, the costs to earnings will be considerable — Comcast will lose around $1.1 billion, Charter $885 million, and Altice $162 million. AT&T claims it has expanded fiber to the home service to three million homes each of the last two years. It plans to continue expanding fiber buildouts for an additional three years, wiring up communities where a return on investment can be achieved. To stem customer losses, the cable industry will likely have to relent on pricing and promotions in areas where AT&T Fiber already provides competitive service. The cable industry has enjoyed a strong speed advantage over most phone companies for the last few years as nearly 100% of cable operators now offer gigabit download speed. In contrast, phone companies are offering gigabit speed in only about 25% of their footprint, with many telco service areas still stuck with low-speed DSL, often unable to achieve the FCC’s minimum broadband speed of 25 Mbps.